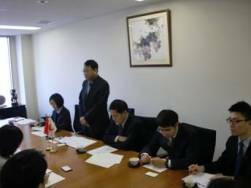 High-level dialogue with the Chinese authorities has always been important for JICE to confirm its direction and guidance in implementing various exchange and cooperation programs with China. 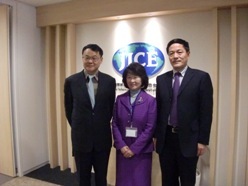 On Wednesday, November 18, 2015, a six-member high-level mission from The Jiangsu People’s Association for Friendship with Foreign Countries headed by Mr. Cai Xisheng, Deputy Inspector, Foreign Affairs Office of Jiangsu Provincial Government visited JICE Headquarters. 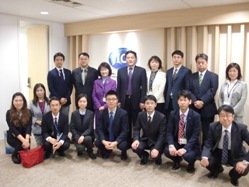 They were provided with an overview of various JICE activities ranging from training, youth exchange, scholarship management to support for settlement of foreign residents in Japan with reference to their profile for China by President Sachiko Yamano and other ten core staff members of JICE. 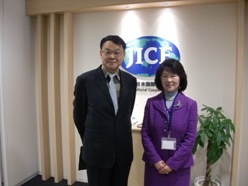 The both parties reviewed on-going cooperation between JICE and Jiangsu Province based on the “Memorandum of Understanding regarding the Friendly Cooperation between JICE and Jiangsu Provincial Government” signed in December 2010 and reaffirmed necessity to study the possibility of cooperation involving Jiangsu Federation of Industry& Commerce / Jiangsu General Chamber of Commerce and Jiangsu Provincial Women’s Federation.